Washington (CNN) - Three new national polls of likely voters released in the past 24 hours indicate the race for the White House is all knotted up and suggest that Republican presidential nominee Mitt Romney got a bounce out of last Wednesday's first presidential debate. According to a CNN Poll of Polls that averages all three non-partisan, live operator surveys, Romney has the support of 48% of likely voters, with President Barack Obama at 47%. While the CNN Poll of Polls does not have a sampling error, the margin is well within the sampling error of the three surveys averaged into the CNN Poll of Polls. The surveys are the Pew Research Center, which was conducted October 4-7 (entirely after the debate), American Research Group, which was conducted October 5-8 (entirely after the debate), and the Gallup Daily Tracking Poll, which was conducted October 2-8 (partially before and mostly after the debate). 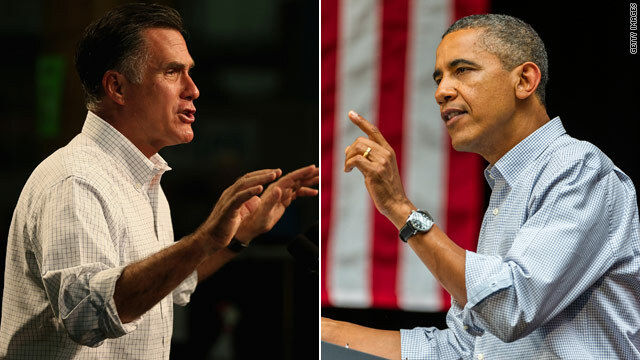 The Gallup daily tracking poll indicated Romney at 49% and Obama 47% among likely voters. This is Gallup's first release of a tracking poll of likely voters, so no comparison can be made to pre-debate surveys from Gallup. The ARG poll indicates the former Massachusetts governor at 48%, with Obama at 47%. According to ARG's previous poll, conducted Sept. 27-30, the president was at 49% and Romney at 46%. The Pew Poll indicates Romney with a 49%-45% advantage over Obama. In Pew's previous survey, conducted in mid-September, the president had a 51%-43% lead among likely voters. Q: What do polls and Mitt Romney have in common? A: They're both prone to reverse themselves in a moments notice. just for fun i always tell the pollsters that i will vote for obama even though i will not. i have other friends who do that as well. i would not trust the polling data. Who the hell are all these people that are even thinkiing about voting for Romney? Considering the right wing extremist policies of Romney/Ryan, I can't believe this election race is even close. Obama should be up 65%- 35% at this point. No wonder the country is going down the drain! There are too many voters who are uneducated about the issues, fickle minded, etc. They obviously can't see thru all Romney's lies, gaffes, etc. The man is simply not qualified in any way, shape, or form to be President, period! The viewing audience would go completely wild with glee!! Debates without teleprompters, that's the name of the game. R&R all the way, everyone should watch Obama's America 2016. 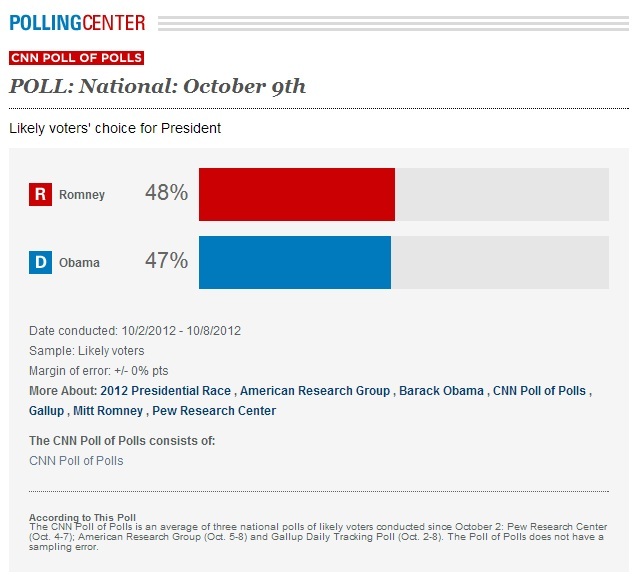 Personally I like Obama slightly better than Romney, but he only has himself to blame for these polls shifts. I really don't know what he was thinking during that debate. Did he not prepare enough (and why)? Did he underestimate Romney? Did he underestimate the debate's political significance? Was he overconfident given his usual talent with public speaking? Yes, Romney made points with questionable or no validity (and Obama was guilty of the same). But time and time again political historians and analysts have said that in presidential debates, it's not about what you say it's how you say it. Calling out Romney the day after the debates is too little too late.